And for me…splurges tend to happen when food is involved. Mainly…grocery shopping. Something catches my eye, peeks my interest, and before you know it, the plan to stick to the already tight budget is out the window and I’m scraping by the rest of the week. But it’s okay…because I have food. Right? Well, a splurge happened this past weekend. I was wandering the aisles of Whole Foods, which already is a dangerous thing, when my roomie spotted these little brown boxes. The words “PHO” caught her attention first. Followed by “GLUTEN-FREE.” Now we’re talking. She’s been wanting to have pho for a long, long while…but…I just don’t know of where to go in Louisville to make that happen for her. Instead…we figured this might be a good way to use up some of the produce and make our own version of a pho. And why not? If you can’t get creative in the kitchen…there’s no point to having one. The product we spotted was by Star Anise Foods. It’s called Happy Pho, and it comes in three different flavors. We chose the Garlic Goodness Vietnamese Brown Rice Pho Noodle Soup. We figured we’d eventually try them all…if the one we tried was any good. Cathy loves garlic…so I had a feeling that would be the one to start us off. Instead…with a little refrigerator magic…and a Organic Vegetarian Pho Base by Pacific Natural Foods (which was in my pantry, swear to the culinary gods! ), this splurge of a purchase became tonight’s dinner. And tomorrows lunch for that matter. Let’s talk a little bit about this product though. First of all, Star Anise Foods Happy Pho – Garlic Goodness Vietnamese Brown Rice Pho Noodle Soup is not only gluten-free, but also non-GMO, low in sodium, contains no MSG, made from 100% brown rice with organic green tea, vegan, all natural, made with organic ingredients, fat-free, wheat-free, egg-free, dairy-free, free from artificial colors and preservatives. It’s ALL NATURAL, my little pho babies!! One serving is 1/2 the packet, which my roommate and I stretched out into 4 meals, so we’re only eating 1/4 of the packet each. Regardless, a regular serving will provide you with 222 calories. A serving only has 190 mg of sodium, which is amazing for a shelf-stable, packaged product. 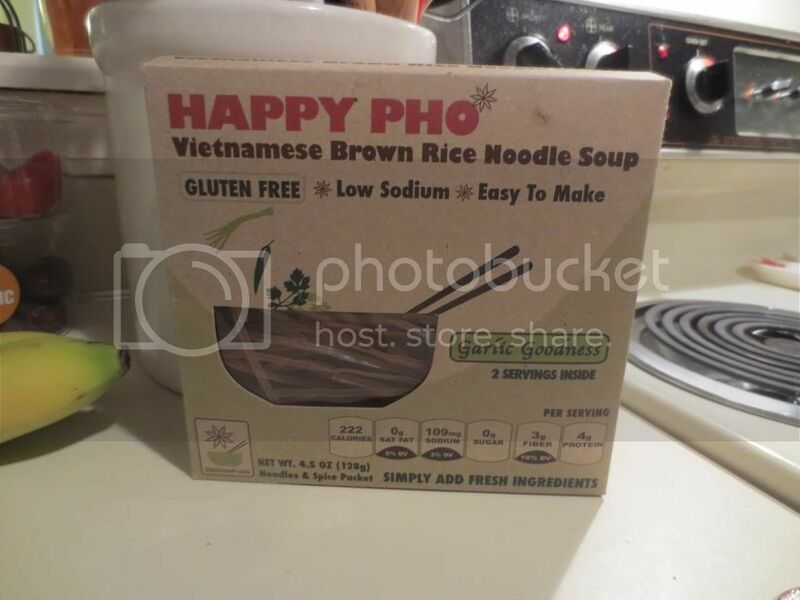 The Garlic Goodness variety of Happy Pho also will has 1 gram sugar, 3 grams of fiber, and 4 grams of protein. That’s really good!! To make my pho…I pan fried up some thinly sliced tofu. While the pho starter came to a boil, I added the packet of seasoning that comes with the noodles and allowed it to blend with the pho starter. I then sliced up some bok choy (compliments of my CSA bin) and put it into the broth. 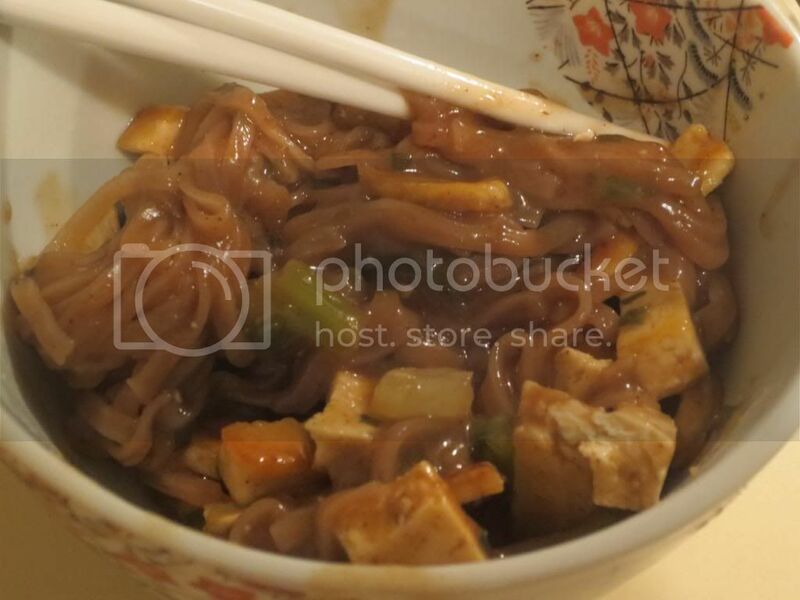 Once the tofu was nearing completion, in went the brown rice noodles to soften up in the hot soup base. As the noodles finished up, I poured the tofu in to warm and…dinner was easily served. And…OMG…was it ever good!! I mean super good. As in I make a mean vegetarian pho thanks to Star Anise Foods and their Happy Pho starter kits. Honestly. I was so happy with the flavor of this noodle soup. The brown rice noodles were a bit gummy, but that tends to be the trend with brown rice noodles. Sadly enough. But…the flavor was there, and the noodles, broth, tofu, and bok choy all married together to make this incredible, flavor-filled meal. The seasoning packet combined with the pho soup base made a perfect base for the vegetables, tofu, and…the noodles. My roommate and I devoured this with chopsticks. Happy girls, we were! Food Yoda, I speak like. Go to your local Whole Foods…check out their aisle with the Asian foods. If you spot Star Anise Foods Happy Pho kits…buy one. Buy them all. Trust me, they are totally amazing and I intend to pick up more of them, other flavors, and give them a taste as well. This made for a quick, easy, and very delicious (and nutritious) dinner tonight. I was beyond impressed. This entry was posted in Asian, Clean Eating, Entree, Food, Gluten-Free, Products, Review, Soup, Tofu, Vegan, Vegetables, Vegetarian by The Celiathlete. Bookmark the permalink.